Prefers a sunny location Easy to grow Water when dry Proper name: Hylocereus undatus The plant you will receive is growing in a 3" pot. 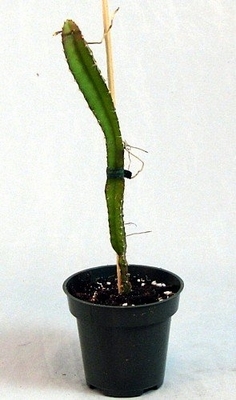 A vining, terrestrial or epiphytic cactus, with fleshy stems reaching from a few inches up to 20ft long (in mature plants). The plant may grow out of, and over the ground or climb onto trees using aerial roots. Flowers are ornate and beautiful, and many related species are propagated as ornamentals. They bloom only at night, and usually last just one night where pollination is necessary to set fruit. In full production, pitahaya plants can have up to 4-6 fruiting cycles per year. The fruit is popular eaten chilled, out of hand. It is also used to flavor drinks and pastries. Unopened flowerbuds are cooked and eaten as vegetables.